What could be better than an eye-catching hanging flower basket display of brilliant living colour to brighten your house/garden? Pick your own fresh Strawberries, Raspberries, Currants, Tayberries, Tomatoes, Cucumbers, Runner Beans, Apples & more. We have a wide range of quality plant nursery plants for sale at very reasonable prices. Perfect for filling those bare gaps. We are a small, family-run nursery. We have been in business for almost 100 years and over 3 generations of the same family. Originally an apple orchard with livestock, the nursery has evolved over the years into growing flowers in greenhouses and fruit in the fields, serving the wider Birmingham region. So come along to pick your own fruit or buy fruit and vegetables direct from our shop. 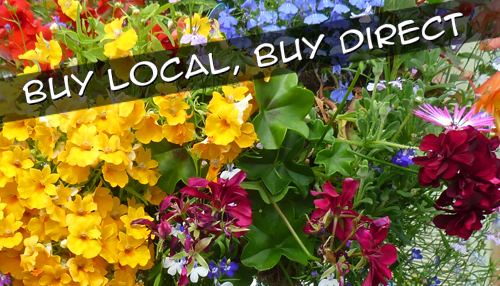 We have a fabulous collection of hanging flower baskets, as well as a great selection of bedding plants too. Plus perennials and shrubs, as well as compost and moss and other basic nursery supplies. We are known for good value produce at good value prices; and our friendly, helpful and knowledgeable service.